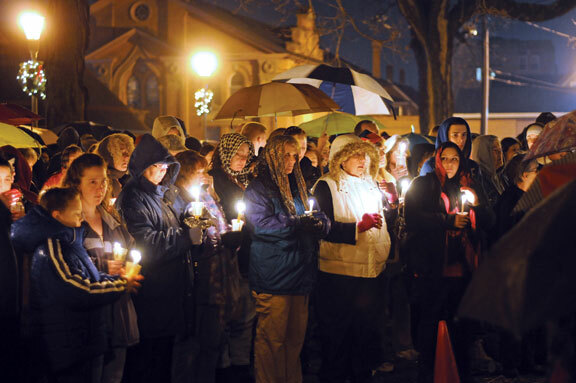 NAUGATUCK — The cold and rain could not deter area residents from coming out in force to grieve the loss of children, educators, and one of their own. A large crowd gathered on the Naugatuck Town Green Tuesday night to remember the 26 slain at Newtown’s Sandy Hook Elementary School last Friday. Amongst the dead were 20 children and six educators, including the school’s principal and Naugatuck native Dawn (Lafferty) Hochsprung. Last Friday morning, 20-year-old Adam Lanza shot and killed his mother, Nancy at their home in Newtown before driving to Sandy Hook. According to state police, Lanza forced his way into the school and killed himself as police arrived on the scene. According to reports, Hochsprung rushed to the sound of gunfire and broken glass to help her students. She was married with two daughters and three stepdaughters. Hochsprung was a member of Naugatuck High School’s Class of 1983. She was elected class representative her senior year and was captain of the girls swimming and track teams. 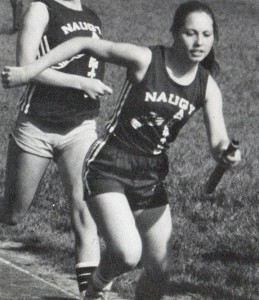 Ron Aliciene, who was Hochsprung’s track coach and teacher, said that Hochsprung showed drive, determination, and desire in every challenge that she undertook. “She was a child every parent would want to have. She was a student every teacher would want in their class. She was an athlete every coach would want on their team. She was a mother and grandmother every kid would want to have. School teacher every parent would want to have their kids in her class. She was an administrator every community would want to have lead their school,” Aliciene said during the vigil. Fred Scheithe had Hochsprung as a student in his sixth-grade social studies class at Hillside Middle School in the 1976-77 school year. According to her obituary, Hochsprung received a bachelor’s degree in special education from Central Connecticut State University and her master’s degree in education from Southern Connecticut State University. She was working on her doctorate degree. Hochsprung joined Region 14 as principal of Bethlehem Elementary School in 2004 and moved to Mitchell Elementary School in Woodbury in 2007. She was principal at Sandy Hook for the past six years. “She was sweet, very protective of her family, and there’s no doubt in my mind that she was protecting her staff and students,” said Nicky Titley, who lived next door to Hochsprung in Naugatuck, before Hochsprung was named a principal in Region 14. Borough resident and Naugatuck Patch editor Paul Singley told those that gathered Monday night how many lives Hochsprung had touched, including his own. Hochsprung was the one who introduced Singley to his wife. Borough resident Kevin DelGobbo had difficulty finding words when he spoke of his friend. 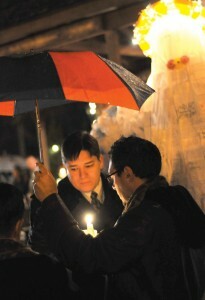 The 25 other victims were remembered during the memorial as well. Paper cutouts of angels with messages to the victims from Naugatuck students adorned the trees around the Green. A large angel with multiple messages made by Naugatuck High School art students stood in front of the gazebo. “Friends, tonight my heart is troubled,” Reverend Gordon Rankin of the Congregational Church of Naugatuck said. Rankin said that in September 11 years ago the town gathered in the wake of another tragedy. “I prayed every day since that there would never again be such a reason for a gathering,” Rankin said. As candlelight cast light through the rainy night, Mezzo said that light showed that the community of Newtown is not alone. “Here we stand on this cold, damp, dark evening, united by a small sliver of light, a light that says to all, particularly our amazingly strong neighbors in Newtown, Connecticut, that you are not alone. When we are challenged in time like these, our faith will not waiver, our families will not break, and the love that we have for one another will live on,” Mezzo said. Mezzo said that, while the children’s lives on this earth were brief, they would never be forgotten. “While your beautiful lives ended too soon we will never forget you. You lived on this earth, you loved, and you were loved by many,” Mezzo said. Mezzo said that the administrators who gave their lives to protect their students were true heroes. “Their acts of heroism in the face of unspeakable evil remind us what is good with all humankind,” Mezzo said. Rankin closed the vigil with a reading from 1 Corinthians 13:7-8. He told the audience that this verse is often read at weddings, but that he found it appropriate here as well. “Love bears all things, believes all things, hopes all things, endures all things. Love never ends,” Rankin said.